Dickey Chapelle began her war reporting career in 1944 when she was shipped to the South Pacific to photograph the activities of the nurses and the use of whole blood in transfusions for the wounded. (For more informatio, please see the Dickey Chapelle page). 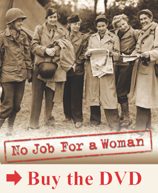 Dickey Chapelle is featured in the film “No Job For a Woman”: The Women Who Fought to Report WWII. Dickey Chapelle, What’s a Woman Doing Here? A Combat Reporters Report on Herself (1962).